Get ready to roll! The availability of family-biking gear such as trailer bikes and cargo bikes has made it easier than ever to ride with kids in tow. Meanwhile, bike lanes and rail trails are being added to the Puget Sound map, making it easier to bike safely with kids of any age. Now, you just need the perfect route for your spring family bike ride: one that’s safe, the right distance and with a snack stop for refueling and a treat. In honor of spring and National Bike Month (May), here are six favorite bike routes for spring, ranging from lazy-day rides to a high-thrill tunnel jaunt that older kids will love. Route: Cross Kirkland Corridor Trail, Terrace Park to the end of the trail at 108th Ave. N.E. 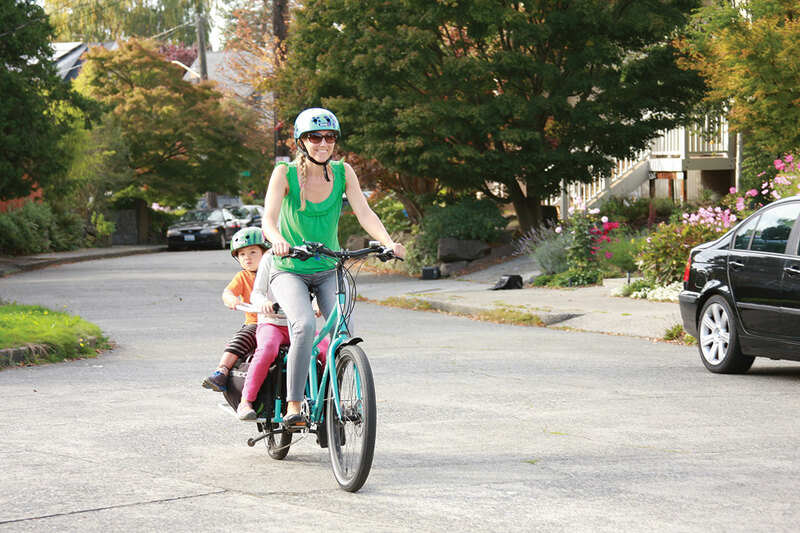 This short ride in picturesque Kirkland is ideal for families with kids on scoots or little ones new to pedal bikes. Park by Terrace Park, a small park about one mile from the Kirkland waterfront, whose ample grassy lawn offers a perfect picnic site where grown-ups can relax while the kids frolic on the play structure. Above the park at the top of the stairs, you’ll find the car-free Cross Kirkland Corridor Trail, a relatively new rail trail that’s part of a larger Eastside rail-trail project. Enjoy peek-a-boo views of Lake Washington and the Seattle skyline as you pedal southbound 1.6 miles, at which point the trail turns into the original railroad tracks again, and then you turn back. An alternative route is to bike north along the trail about .7 miles and stop for a pint at the kid-and dog-friendly Chainline Brewing Company, right along the trail, where you'll sometimes find food trucks on site as well. Minimum age: Kids on scooters or scoot bikes or preschoolers on pedal bikes. Snack stops: The Kirkland PCC is just 3 minutes away (bikeable for grown-ups). Pick up ingredients to build your own picnic: charcuterie, gourmet cheeses, salami, olives, fancy crackers and perhaps your family's favorite chocolate? Menchie’s Frozen Yogurt is also nearby. Cycle the Sammamish River Trail for river views, farm fun and more. 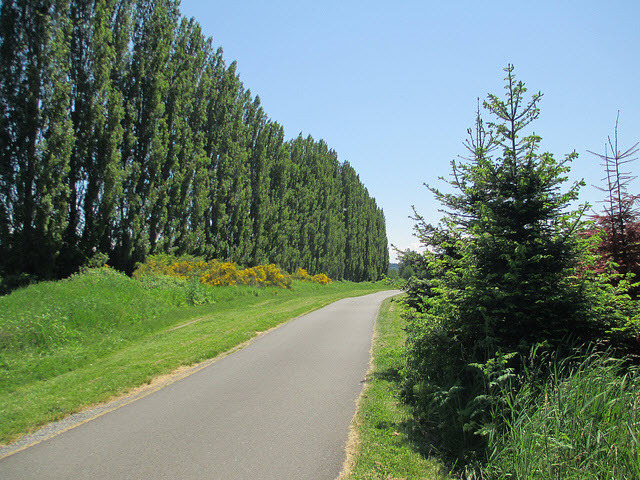 Start the ride at lovely Bothell Landing Park, where you’ll pedal south on the Sammamish River Trail. At about 4.5 miles, you can detour for lunch at the Redhook Brewery (check out the Aerial Adventure Park next door, too). If your pedalers are up for more, continue along the Sammamish River Trail to Marymoor Park (10.9 miles), enjoying peaceful agricultural landscapes. For more play time before your return, Marymoor Park offers climbing structures, trails and even a velodrome. Minimum age: For kids ages 7 and up who are comfortable riding independently or any age on trailer bikes or tot seats. Snack stops: At Redhook Brewery enjoy burgers, sun and microbrews; in downtown Redmond, kids will scream for scoops at Molly Moon's Redmond location, conveniently next door to Homegrown. Or head to the Redmond Saturday Market at nearby Redmond Town Center (open starting in May), for produce and snacks from more than 80 vendors; or Ooba Tooba Mexican Grill, an upscale taquería in downtown Redmond, just a quick ride from Redmond Town Center. Choose your own adventure in Ballard! 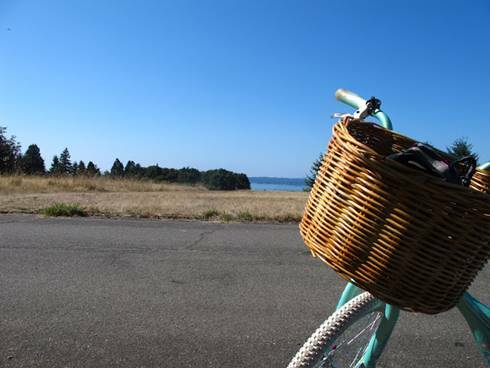 Start at Golden Gardens Park and ride south on a flat, scenic section of the Burke-Gilman Trail. If your fam is up for a paddle, stop by Surf Ballard on Shilshole Bay, which rents paddleboards by the hour (reserve online). After you finish with your upper-body workout, pedal to Hiram M. Chittenden Locks, where you can laze around on the lawns (a perfect picnic stop) or walk your bikes across the Locks. If you're up for more of a challenge, wind your way up the hills of Magnolia to Discovery Park, one of Seattle’s wildest, most view-rich parks. Ride to the park via 32nd Ave. W. and W. Government Way, where you’ll cross a funky bridge over train tracks and the Kiwanis ravine (home to Seattle‘s largest nesting colony of great blue herons). Enter the park on Discovery Park Boulevard. Note: Within Discovery Park, bikes are limited to paved roads. Do not ride on unpaved trails. 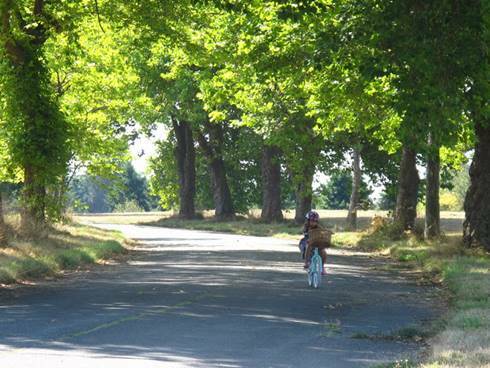 Minimum age: Any child who can ride several miles independently should be comfortable pedaling to the locks on the bike path; older middle schoolers and teens who are comfortable with street riding (and hills) can go all the way to Discovery Park. Snack stops: Brunch at Portage Bay Café near the entrance to the Locks in Ballard, famous for its pancake buffet (brunch served until 2:30 p.m. every day; make reservations online). 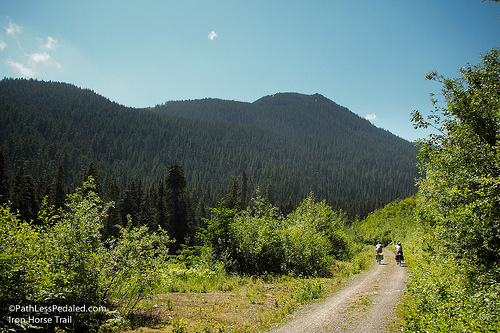 At Snoqualmie Pass, an exhilarating (or terrifying, depending on how you look at it) cycling adventure awaits: The 2.5-mile Snoqualmie Tunnel, a former railway tunnel that bores through the mountain on the 110-mile gravel rail trail known as the Iron Horse Trail. “It is the longest tunnel open to nonmotorized travel in the U.S.,” says Russ Roca of the Path Less Pedaled website. Park at Hyak, an entry point to Iron Horse State Park at Snoqualmie Pass (you’ll need a Discover Pass to park). West of the lot, find the Iron Horse Trail, a wide gravel path that leads to a metal gate; the tunnel entrance is about one-third of a mile away. Be sure to wear reflective clothing, and bring bright bike lights and well-charged headlamps. Hikers and bikers traveling at various speeds — that you cannot see without a light — can be inside the tunnel. Roca also recommends extra layers: Even if the temperature outside the tunnel is 75 degrees, the inside can be a chilly 45. Stop for a picnic and views at the end of the tunnel, or continue on for a backcountry cycling experience that offers bridges over beautiful rivers, campsites and even crosses the Pacific Crest Trail. Once you head back into the tunnel for your return trip, you will not see the light at the end of the tunnel until you reach the bend near the start. Find more info at the Washington Trails Association website. Minimum age: All ages of kids who are comfortable riding on gravel (and not too afraid of the “dark”). Snack stops: This is a bring-your-own-snacks ride, but you could start a little campfire at one of the campsites on the side of the trail and roast marshmallows. Or pack your favoritet picnic fare. The 29-mile Centennial Trail that runs from Snohomish to points north was once a Native American path. It then became a railroad and is now a recreational rail trail that offers sweeping views of the lush Snohomish River Valley. You can do several kinds of rides on the trail, but a fun family ride is to start from Machias Trailhead Park, 5 miles north of Snohomish, and ride south on the wide, paved trail to the town, where you can refuel on baked goods or burgers. If this distance is too far, start farther south at the Pilchuck Trailhead (2.1 miles from Snohomish). Or lengthen the route by starting at the 20th Street N.E. trailhead in Lake Stevens. Snack stops: The Snohomish Bakery is a crowd-pleaser for baked goods and coffee. For lunch, try Trails End Taphouse & Restaurant or Grilla Bites in Snohomish. 6. Trains, ships and the Sculpture Park, oh my! “Mama, look at all the trains!” my son yells from behind me on our bike. 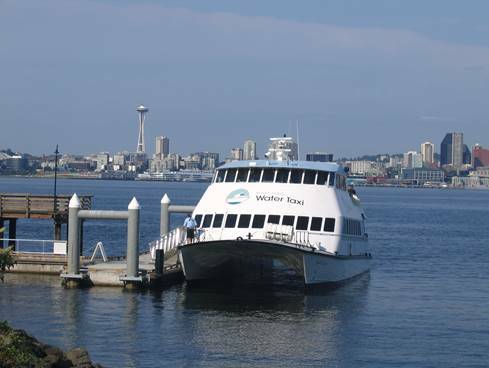 We’re riding one of my favorite routes in Seattle, from the Fremont Bridge to the Seattle waterfront to take the King County Water Taxi to West Seattle. It takes about an hour and is chock-full of great sites. 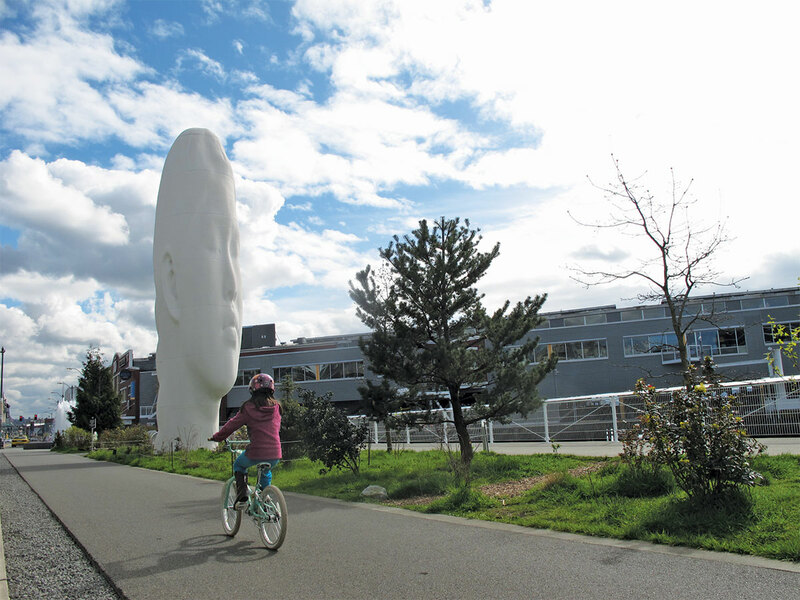 Cycle past the Olympic Sculpture Park (ask your kids questions about the different sculptures you’ll see), and along Alaskan Way to the King County Water Taxi at Pier 50. Note: There is major ongoing construction along the waterfront so use caution and follow all posted route signs. If you’re up for more riding, the scenic Alki Trail in West Seattle extends for miles along the beach, with more gorgeous views. Minimum age: Because this is a busy route, it’s best for kids riding attached to their parents' bikes (in trailers, seats or trail-a-bikes), or older tweens and teens able to ride longer distances and navigate cycling and street traffic. Snack stop: A must is Marination Ma Kai, right at the King County Water Taxi stop in West Seattle, for Kahlúa pork sliders, kalbi beef tacos and shave ice. Alki offers more refueling stops. A bike-ready coffee mug and holder such as the Vacuum Insulated Black Trim Travel Tumbler (with oh-so-essential, one-handed push-button operation). Thin, bright, breathable gloves for signaling and smart-phone operation, such as the Duraglove ET. A nice loud brass bell. The Crane Brass Riten is a beauty and has enough sound to carry. Sold locally at G&O Family Cyclery. Bike Basics kit, with tools, tube repair and more. Essential for any Seattle bike fanatic, a Brooks Rain Cape. Editor's note: This article was originally published in April 2015 and updated in May 2017.